FREDERICK, MD: Hundreds of bells and chimes will open the new museum season in Frederick County during the Bell & History Handbell Festival on Sunday, April 7 at the Basilica of the National Shrine of Saint Elizabeth Ann Seton in Emmitsburg, Maryland. The 5:30 p.m. concert will include five bell ensembles playing solo selections and performances, including all of the amassed handbell choirs. There is no charge, no reservations are necessary, and the public is invited. The concert will last about an hour. “Traditionally, the Bell & History Handbell Festival marks the grand finale of the Bell & History Day weekend festivities, and we’re pleased it will be the Sunday highlight again this year,” says Elizabeth Scott Shatto, Coordinator, Frederick Historic Sites Consortium. The mass selections are Salute to Our Military, by Valerie W. Stephenson, and An American Pastiche, composed specifically for the Handbell Festival by Amber Ion. The conductor of the mass ring selections is Dr. Pamela Ion, Director and Arranger of Alpha 4, located in Gaithersburg, Maryland. Salute to Our Military is a medley honoring the men and women of our military, which blends patriotic tunes that are familiar to everyone. Melodies featured in this medley are, America the Beautiful, Marine Hymn, Eternal Father Strong to Save, Anchors Aweigh, and The Caissons Go Rolling Along. An American Pastiche is a majestic and graceful composition, which includes a vocal solo, a small choir, orchestration, three to five octaves handbells, and a two octave handbell descant. The songs included in the pastiche, which means medley, are: America the Beautiful, Taps, Stars and Stripes Forever, My Country ‘Tis of Thee, The Star-Spangled Banner. The Pastiche will end with Lee Greenwood’s 1984 song, “God Bless the USA”. In addition to the mass selections, each participating group will play a solo selection. A diverse repertoire will be presented, including secular and sacred music. Choirs from the following churches will participate: Graceham Moravian Church in Thurmont, Evangelical Reformed United Church of Christ in Frederick, Evangelical Lutheran Church in Frederick, and Mt. Airy Presbyterian Church in Mt. Airy. The size of the groups varies but includes several large choirs playing four or five octaves of handbells and up to three octaves of handchimes. Alpha4, a small, independent four-in-hand ensemble, will also perform. This group demonstrates the interlocking handbell technique that allows each member to play with two to three bells in each hand, meaning that each person is holding and ringing anywhere from four to six bells at any given time. The handbell festival is made possible by presenting sponsor, Frederick County Bank, with additional support from the Tourism Council of Frederick County. 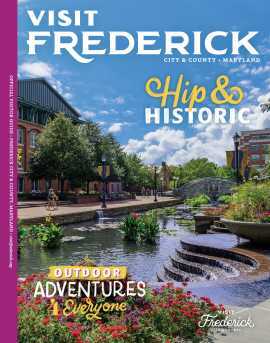 Bell and History Day weekend is an activity of the Frederick Historic Sites Consortium, a program of the Tourism Council. Detailed information about Bell and History Day on April 6, and the Bell and History Day Handbell Festival on April 7 is available at www.fredericktourism.org For more information, call the Frederick Visitor Center at (301) 600-4047 or visit www.fredericktourism.org.